‘Design a Robot’ competitions – LET'S TALK ROBOTS! Didn’t get a robot entered in the DARPA grand robotics challenge (DRC)? Never mind, there are several robot design and business model competitions on at the moment, from social robots, to affordable robots, to open source humanoids. The International Conference on Social Robotics (ICSR) is running a design competition for robot companions. RoboSavvy is running a design competition for an open source humanoid robot and the African Robotics Network (AFRON) is running their second annual “$10 robot design” challenge. Deadlines are approaching so get designing! The International Conference on Social Robotics (ICSR) will be held in Bristol UK, on 27th – 29th October 2013. ICSR welcomes conceptual or practical submissions to the robot design competition, based around the theme of companionship. Can a robot offer companionship? Could a robot friend be your confidante, your wing-man, your ally or your last defence against loneliness? the conference audience in a busy room during an hour long session. We are looking for ideas for creating future robots that people will want to spend time with in a social sense, and the benefits that such robots may give to society or individuals. The robot design competition is jointly run by Bristol Robotics Laboratory and Watershed’s Pervasive Media Studio. One person from each of the top 10 selected designs will be invited to attend half of a day of the conference (registration fees waived) to present their ideas. Following the presentation, conference attendees will vote for the top three entries, all of whom will receive certificates and prizes from our sponsors IET Robotics & MechatronIcs TPN <>. Deadlines for applications: Friday 13th September 2013, 17:00 GMT. The RoboSavvy Humanoid Design Competition ends on September 22nd and is open to all. Robosavvy is looking for your help in gathering fresh ideas for the design of a new humanoid robot designated for entertainment and education. Their objective is to launch a new open-source humanoid robot that will look great and will be agile and smart at a reasonable cost. Think Bioloid, think Darwin, then think ‘a thing of beauty’. Comparable education and research humanoid robots cost over $10,000 due to their plastic molded shell parts, expensive actuators and closed-source business approach. RoboSavvy are looking for an open-source robot that will outperform its rival platforms while keeping the cost of materials to about $1,000, by utilizing materials and fabrication methods now available to anyone. Materials include aluminum sheet and 3D printed parts for structure, vacuum formed polycarb exterior shell, servos for actuation and low cost electronics including Raspberry Pi for brains. It’s all about exterior aesthetics and a good range of movement. The winning entry will receive the custom built robot (valued in parts and labor at $4,000), with GrabCad swag for runners up! Full specs for the challenge are on GrabCad. The African Robotics Network (AFRON) is holding their 2nd Design Challenge in search of the “Ultra-affordable Robot”. The deadline has just been extended to January 2014, to allow greater opportunity for university students to participate as part of their semester projects. With support from the IEEE Robotics and Automation Society, this design challenge focuses on enhancements to the robot designs from the 2012 challenge, software development, and teaching plans. Details are below, and on the web at http://www.robotics-africa.org/2013-design-challenge. 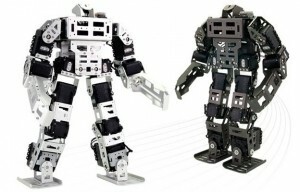 The 2012 Design Challenge emphasized an ultra-low-cost robot hardware platform in three categories: tethered, roaming, and all-in-one. The winning designs were all highly creative, and the Grand Prize in the tethered category went to Lollybot, a brilliant design by Tom Tilley of Thailand, costing just under 10 USD and incorporating two functional Lollipops. 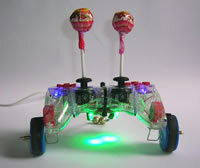 Starting with a generic dual-shock game controller, Lollybot can be built using commonly available tools anywhere in the world. In the 2013 Design Challenge, our goal is to create incentives for designers to select any of the winning designs from 2012 and work on enhancements in one or more of 3 categories: 1) hardware 2) software, or 3) curriculum. This year, we are placing a special emphasis on Lollybot, encouraging next steps in the 3 categories: 1) enhance the Lollybot hardware design, simplifying assembly, increasing robustness, adding useful features, 2) extend and improve the open-source software for Lollybot, and 3) create exciting lesson plans using the Lollybot. In addition, there is a special “community challenge” for participants who organize a robotics workshop for students using one of the winning designs, with or without enhancements.